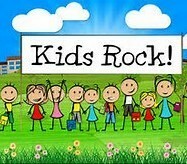 Join us Wednesday nights from 6:00 to 7:30 for CVKids Rock! We have lots of activities...Bible stories, recreation, Bible verses to memorize....and a snack in the middle! Join your friends for this fun time!